This is a special invitation to all organists and pianists in the Kansas area! 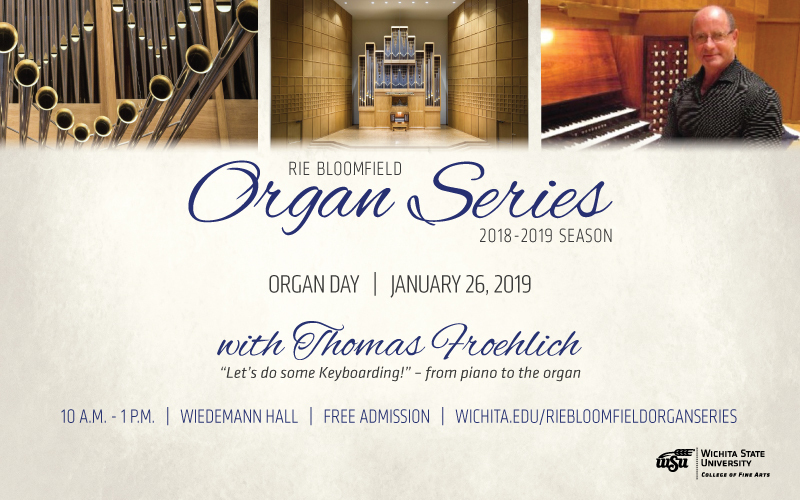 Please come and join us to discover and play the great Marcussen organ in Wiedemann Hall on the campus of Wichita State University on SATURDAY, JANUARY 26, 2019 between 10:00 am and 1:00 pm. Guest organist from Dallas’ First Presbyterian Church, Thomas Froehlich, will be there to guide us through what it is to play the organ today, how to use creative registration, how to “hear” the instrument out in the room: what about all those acoustics?, and can all of those stops be used together? Is this really a wind instrument? Bring your favorite organ or piano piece to try it out!